WBO World Champion Aleksandr Usyk (13-0, 11 KOs) and WBC World Champion Mairis Briedis (23-0, 18 KOs) exchanged words in Riga at the last press conference before the Ali Trophy semi-final bout in the Latvian capital on Saturday. “I am going to entertain the crowd at the Arena Riga – that I can promise,” said Usyk. 10.000 fans are expected at the Arena Riga for the biggest unification fight in many years in the cruiserweight division; a semi-final in the World Boxing Super Series with a final in May in Jeddah, Saudi-Arabia and the Muhammad Ali Trophy at stake. But hometown hero Briedis insists he doesn’t feel any pressure. 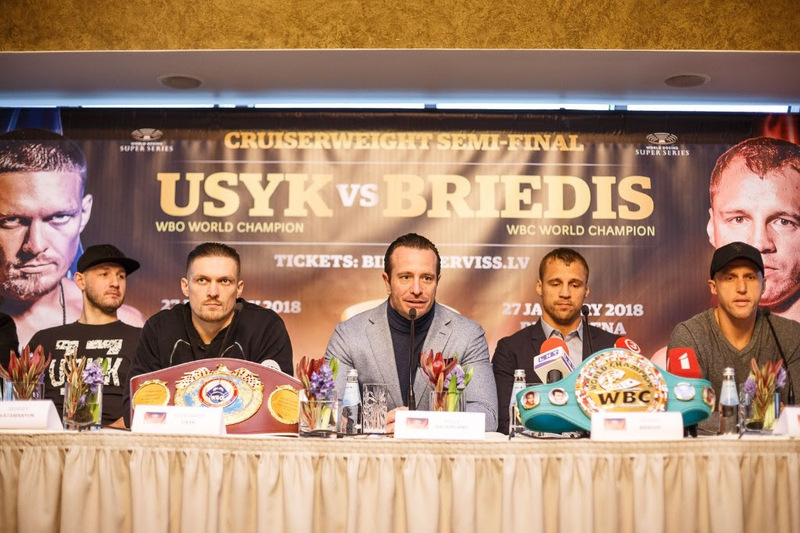 Tickets for the Usyk vs. Briedis, a semi-final in the cruiserweight division of the World Boxing Super Series, are on sale via bilesuserviss.lv.